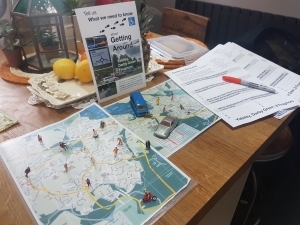 From the start of this week (Monday 5th November), the members of the group have started collecting evidence in earnest about the issues connected with ‘Getting Around‘ Yateley, Darby Green and Frogmore. One of the first things we will be doing is holding regular sessions in Cafe 46, in the heart of the village. It is a chance to hold detailed, consultative conversations, where we can collect qualitative insights as to how people get around the area, what things would improve that experience – and where they are usually heading – whether on foot, in a wheelchair, on a bike, driving a car, a motorbike, on a bus or minibus – or heading for a train, or further afield. Slinkachu-style model figures on a map of the area were a way to get people thinking about the challenges of ‘Getting Around’ our patch. We have designed a basic questionnaire which forms the starting point of our conversations, and we will use this in a number of different environments with a wide range of people, all with a view to discovering themes and patterns, not just ‘ticking boxes’. Already, from our opening session this morning, a number of consistent themes were presenting themselves, and we will be returning to those in future blog posts. 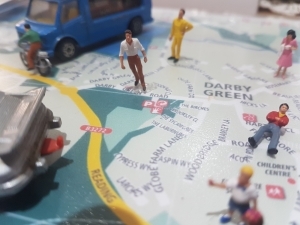 We used ‘Slinkachu-style‘ model figures on a map of the area as a way to start thinking about the challenges of getting around the area – and they proved really popular! As a subject group, the ‘Getting Around‘ team is charged with developing policies on this topic, supported by evidence, including of consultation with relevant stakeholders. There is not a great deal that a plan like this can do about transport issues (as a policy area, these things are governed at other levels of power – at county level, and at national level, for example), but with some innovative thinking, there may be some specific ideas we can get inserted which will help shape the future development of Yateley. 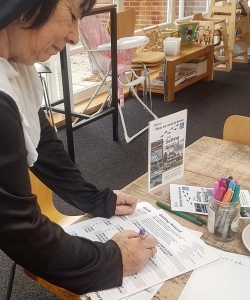 A customer in Cafe 46 joins us to discuss their experiences of ‘Getting Around’ Yateley – and starts completing the form. We’ve also made sure we’ve looked at how our transport/traffic subject brief fits into the local plan developed by Hart (our local planning authority) which we have to take care to ensure our proposals feed into, and don’t conflict with. It has also been useful to look at how neighbourhood plans in other towns and villages around the country have tackled these issues. There have been some consistent policies developed so far elsewhere, particularly around clear, prioritised pedestrian routes and cycleways, as well as support for community transport, and forward-thinking use of public spaces. We will return to that in future posts. And of course, we’ve been making sure that we’ve been ‘walking the patch‘ – making sure we get a good feel for everybody’s everyday experiences of getting around our own town. ‘Getting Around’ subject group co-lead Paul Simpson (left), with fellow group member, Di Swait. It is clear that ‘Getting Around‘ is an important issue to local residents, and we have been overwhelmed that nine people have come forward to join our team of volunteers, to work on developing a series of policies and aspirations which may eventually end up in the new neighbourhood plan. We will introduce each team member properly over future posts, but the co-leads of our group, Paul Simpson and Luke Buckland were joined during the morning at Cafe 46 by fellow group members Di Swait (pictured above) and Melanie Palin (pictured below). Di is retired, but is an active member of the community, having moved to the area in recent years. 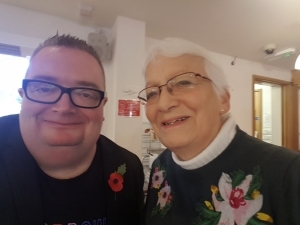 She has been a volunteer in a number of roles (including PALS), and is a member of a number of community organisations, including Home Alone. She is a driver, a user of public transport, and a pedestrian. Di has already started exploring those networks can help assist in disseminating this evidence gathering process. Mel was born in Yateley, returning to the area in Easter 2017 after spending time away. She walks often, and would like to cycle more, if there were more dedicated routes. She has two teenagers, and is keen for them to be able to get about independently. She is employed as a detached youth worker, and volunteers with both Vision4Youth, and St. Peter’s Y-Friday youth group. The group want to make sure we gather the voices of as broad a range of people as possible, including young people. 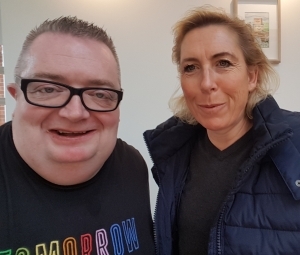 Paul Simpson (left) with fellow ‘Getting Around’ subject group member, Melanie Palin. As well as introducing the rest of our group in future posts, we talk about what we are doing, and reflect further on some of the issues, and the process involved. As well as Paul and Luke (who are co-leading the group) and Di and Mel (who we have introduced you to above), the other members of the group are Camilla Bailey; Wilf Hardy; Yogesh Patel; Charlotte Richards and Sue Smith. Who knows – the mere fact of getting so many individuals in the town talking to each other about improving things for pedestrians, cyclists, wheelchair users, drivers, and users of public & community transport alike could have other spin-offs beyond the formal neighbourhood plan process? Thank you to everybody who took the time to stop to chat to us about these issues today. Look out for us again in Cafe 46 (who we would like to thank for making us so welcome – we will usually sit on the long table) – and in other places around Yateley, Darby Green and Frogmore in the coming weeks and months.